"I highly recommend Judy to come all day to your school. She met with every grade in separate assemblies. Her program was excellent! She had the kids writing with her by the end of the lesson! Now the kids are excited about becoming authors and they love all of Judy's books! It was one of the best programs I have ever had! It is money well spent!" 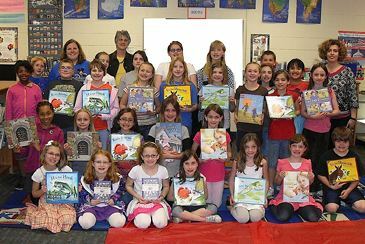 Offering a variety of educational programs, Judy has presented to K-8 students at over 750 schools in 27 different states. In addition, she has spoken at over 120 school family nights and 50 children’s literature festivals and libraries. Each of her programs has a different underlying theme based on one or more of Judy's award-winning books, but all programs emphasize the writing and publication process. In addition, each of Judy's programs has different grade level versions so the content matches the age of the audience, and each program uses power point visuals so everyone can easily see. For Elementary Schools: Judy usually comes for a full day, seeing students in grade level or combined grade level groups. Sessions are 60 minutes each for grades 2-6, 30 minutes each for grades K-1 and 15 minutes for PreK. These times include entry and exit time so sessions can be back to back. Most schools can fit five or six sessions into a day. For Middle and High Schools: Presentation session length is typically 60 minutes but this time frame can be modified from 50-90 minutes per session so presentations can be scheduled to fit your school's class time schedule. Sessions may be held during English, reading, writing or library class periods or in whole grade level assemblies. Special Events: Judy also offers Parent Night Programs and Writing Workshops for Students and she is a frequent speaker at libraries, young author conferences, and children's literature festivals. Contact Judy for price quotes and to discuss the needs of your event! "What's it like to be an author?" is a question students frequently have. From rough drafts, revisions, editing and finally publication, your students will discover that authors actually do what they are learning in class. Judy starts by reading A Pet for Miss Wright, about an author whose pet helps her through the writing process. Then, Judy shares the behind-the-scene stories of how ideas change to words, and words turn into books. When Judy visits your school, she comes for a full day, usually seeing students by grade level, with up to six presentation sessions. Sessions are 60 minutes long for grades 2-8 and 30-minutes for K-1. This program is excellent for schools, libraries, young author events and children's literature festivals. From ballads about butterflies, jingles about jellybeans or quatrains about quilts, your students will discover the magic of poetry as author Judy Young presents her book R is for Rhyme, A Poetry Alphabet which received the Mom's Choice Award Gold Recipient: Educators' Choice, a starred Kirkus Review, a National Parenting Publications Honor Award and the Missouri Writers' Guild Best Juvenile Book Award. As Judy reads her poems and shares the stories behind them, students actively enter into the poetry writing process, becoming "poetry detectives" as they search for poetic tools, terms and techniques such as rhythm and rhyme, metaphor and alliteration, and specific poetic structures. Students then get the opportunity to become poets, as Judy leads them through group poetry writing activities. Your students will go West as they travel with Judy down the Oregon Trail. Using A Book for Black-Eyed Susan and Minnow and Rose, Judy will discuss the research and writing process of historical fiction as your students follow in the footsteps of the pioneers, seeing the landmark sights and wildlife the pioneers saw and hearing about their daily lives on the trail. This program is excellent for schools, summer school, camps, and libraries. "Basil B. Barnswhitten," (a.k.a author Judy Young) will visit your school, showing students around the world as they discover marvelous, mysterious and maybe even magical creatures hidden in the illustrations and determine whether the creatures are endangered, extinct or never existed! Students will also discover the unique "reversed" writing process of this book, in which Judy wrote to illustrations that were created first! Then, in a group writing activity, students will try their hand at writing to illustrations! When Judy visits your school, she comes for a full day, usually seeing students by grade level, with up to six presentation sessions. Sessions are 60 minutes each for grades 2-6 and 30 minutes for K-1. Students will be motivated to write their own realistic fiction when they hear how facts from nonfiction can grow into fiction stories! Using her award-winning fiction books Judy gives an in-depth look of how she mixes research with the creative process of writing fiction, and how two simple questions can outline a story from beginning to end. When Judy visits your school, she comes for a full day, usually seeing students in grade level sessions. This program is for grades 2-8 only. You may choose a different program for younger grades. 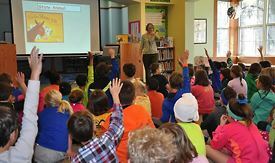 Students take an exciting adventure into some of America’s National Parks as Judy tells about her research trips and how she mixes STEM concepts into fiction writing in The Wild World of Buck Bray Series. In this interactive presentation for kindergarten and 1st graders, your students will hear Judy read one of her Digger and Daisy stories and learn about the writing process. Then, Judy will help them create their own Digger and Daisy story in a group writing activity. When Judy visits your school, she comes for a full day, usually seeing students in grade level sessions. This program is for grades K-1 only. You may choose a different program for older grades. 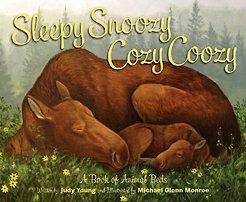 In this interactive program for PreK, K and 1st graders, your youngest students will not only have fun hearing the tongue-twisting poems about a variety of animals featured in Sleepy Snoozy Cozy Coozy but will also learn interesting facts about how and where these animals sleep, as well as the the roles of authors and illustrators. When Judy visits your school, she comes for a full day, usually seeing students by grade level, with up to six presentation sessions. Sessions are 60 minutes long for grades 2-6 and 30-minutes for K-1. Students are looking toward their futures and there are many careers in writing and publishing! Judy shares myths, truths and behind-the-scene aspects of professionally writing and publishing books for children. Perfect for English and Creative Writing classes. When Judy comes to Middle and High Schools, she can adjust her programs to your school’s regular class period length, from 45-90 minute sessions. As your school's writer-in-residence, Judy Young works directly with the students on writing their own poetry. Students explore a variety of poetic tools, techniques and terminology used in poetry such as metaphor, simile, and alliteration as they learn to write a variety of poetic structures. A different poetry writing assignment is given in each session. Teachers can then share their classroom's lessons with their peers, turning the writing workshop into an observational writing workshop inservice for educators as well. 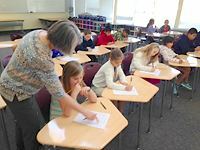 In general, the writing workshop begins with a "large group" introductory session, and then Judy comes into each participating classroom to work directly with students. Because there is an infinite number of ways a writing workshop can be planned, Judy is very flexible, and will work with your school to meet its specific needs. The following will give you some basic information, but please contact Judy for more specific details about tailoring the perfect writing workshop residency for your school or event. Writing Workshop Residencies can be booked for 1-5 consecutive days. Required Introductory Sessions are 60 minutes long. Classroom writing sessions are 60-90 minutes long (preferably 90 minutes). Up to five sessions, including an introductory session, can be scheduled in a day. You may target only one grade level, several grade levels, or all grades. Some schools have Judy working with each classroom only once, others schedule multiple writing sessions per class over several days for an intensive workshop. If time allows, Judy will be glad to give grade level "presentation" sessions to grades not participating in the classroom writing workshops. For Middle Schools: An introductory session is not required, but preferred. Typically, Judy goes into regularly scheduled middle school English classes. Session length can be based on the school's regular class length, or middle schools can schedule sessions to accommodate full 90-minute sessions. This program can be modified for young author conferences, libraries, writing clubs, and educational summer programs. 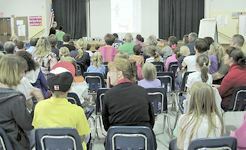 Often schools want a special speaker at their parent nights, reading fairs, literature festivals or other special events. In an informal presentation style designed for a mixed audience of both children and adults, the audience will be taken "behind the scenes" to discover the working life of an author. As Judy reads from her books, she shares the publication process, starting with where ideas come from to rough drafts, final manuscripts and galley proofs. She also discusses the illustration process from the author's perspective. To help increase participation at your school's parent night, ask Judy about a student poetry writing contest to be held in conjunction with this event. This program is excellent for school parent nights, libraries, young author events and children's literature festivals.